Have you ever wanted to post an online question or a comment but have been too intimidated to hit the “comment” or “reply” button? Maybe you were afraid no one else could relate to your question or concern. Maybe you thought you were the only one who hadn’t figured out the answer. Maybe you felt like your question was downright dumb. Yeah, we can relate. You know what else? Just about everyone else can, too. 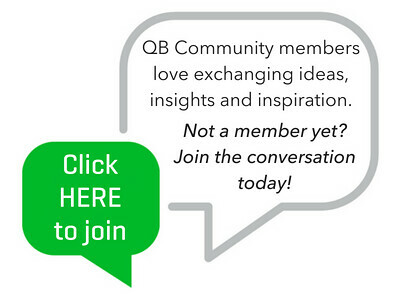 That’s why, in our QB Community, we are 100% committed to creating, maintaining and preserving a safe place for you to share fears, frustrations and high-fives. Not long ago, QB Community member Matthew Fulton (@ParkwayInc) shared what he values most about being part of this community. "It’s my belief that the more we work together, the more we succeed. I hope that by contributing to this community, and sharing my successes and my failures, I might be able to pay it forward just like others have done for me." Thanks, @ParkwayInc. That makes us so proud. Thanks for the great post, @LeslieBarber I'm so grateful to be part of this safe and supportive community and look forward to getting to know so many wonderful entrepreneurs! This is a place that is exactly what I was looking for to learn and grow. Thank you. So good to hear @SteveChase. That's exactly what we hoped. After being on the other forum for more years than I hate to admit to, I am happy to be here as well. I love the friendliness and social aspect to this forum. Many thanks to all of you who are part of the moderating group. Thank you, Leslie! I have been on the other forum for awhile now and don't usually post on it. I rarely have the time to visit these forums, but I do when I have time and they have helped me learn alot. Hey everyone my name is Harish, i am from India ,worked in intuit process when it was in India,Lost my loved one someone told me to do blogging, so here i am , I am good at tech and payroll but not Good in Accounting 😞. Blogging can be a great way to work through your feelings. The best bloggers (any kind of authors, really) are those who write from authentic personal experience.